You are here: Home / Crochet Other / Reviews / Product Reviews / Fun Tools To Check Your Crochet Gauge! When anyone says the word ‘gauge’ it seems like many crocheters run for the hills! I am the first to admit it is one of my least favorite jobs when I am crocheting – right alongside weaving in these pesky yarn ends. I do know though it is a necessary evil for any project I want to ‘fit’ so I grit my teeth and get on with it and when I am designing something for you to make it is part of the process so it is becoming less and less of a chore for me. I guess it is true – when you do something you dislike enough – it does become a bit easier…and now it can also be a bit more fun because there are so many cool tools you can use to check your gauge and your wraps per inch! My tools are a simple 12 inch metal ruler and a pencil I have drawn lines on to mark my wraps per inch. The tools below are the ones I’ve saved to my favorites online. Sometimes I like to buy fun gifts for myself – and these have made it to that list! I think I’ve decided I am going to order #4 and #5 and then #2 just because I can add it to my key chain and it is so darn cute! Which one(s) would you order? I was only familiar with tool number 8. Thank you for the thorough review. I love the Knitters pride elephant gauge tool. It’s practical and adorable. I recognized #6 and #8 right away, as my local Shopko carries Susan Bates yarncraft notions (so I probably own those already). Some of those others look very cute, though! 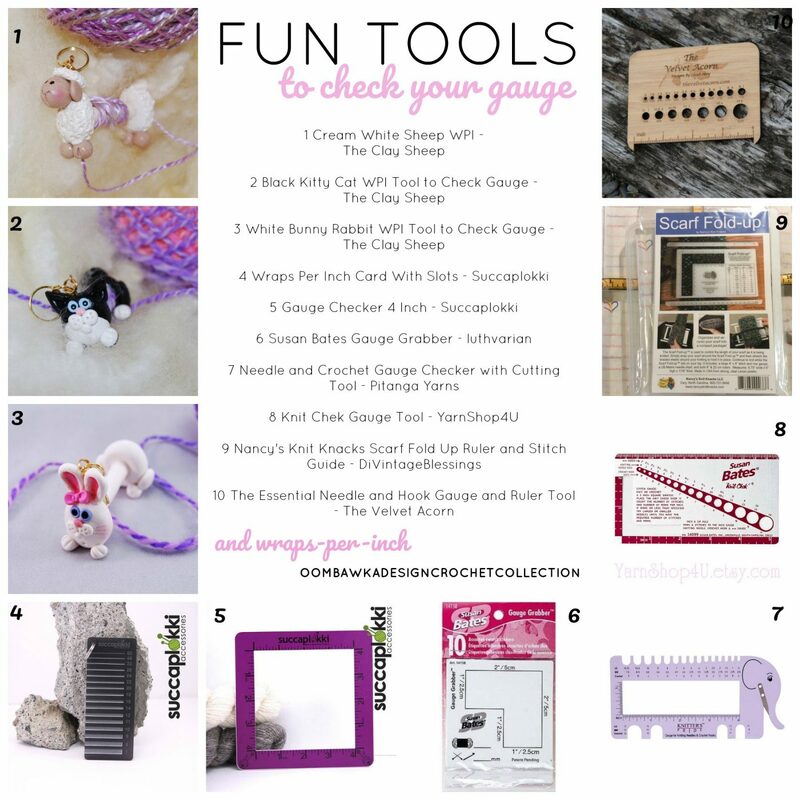 Great ways to check your crochet gauge. I found this a fun, cute and informative post. I like to have my options. Sometimes getting something strictly to serve a purpose that is functional and affordable is all that matters. Yet other times I enjoy splurging and cutesy tools for the same job. Thank you so much for this post – I have been looking for a source. I need to learn how to use the essential hook and needle guage tool from the velvet acorn, I have on just like but its plastic and Im not doing something right and I love that gadget!! Thank you so much for showing all the different tips and tools available to gauge a project. This is something I struggle with.